Happy Friday everyone! Today I have photos of recent purchases I made last week. I have quite a few reviews of Align Crops on my blog and these fit no different from my other pairs. However, the fabric of the black currant and jaded pair feel a little slicker and not as soft as my older pairs. I'm not sure if my older Align Crops became softer with each wear and wash? I guess it could be possible? I'll keep you all posted. Warning- This is a super image heavy post! I'm wearing my usual size 4 in Align Crops. Color comparison: top alberta lake. Bottom- jaded. Okay, so this next picture is super hilarious. Not flattering at all, but I laughed so hard when I saw the photo. The timer went off just as I was about to sneeze. After that, I couldn't help but smile in the next photo. 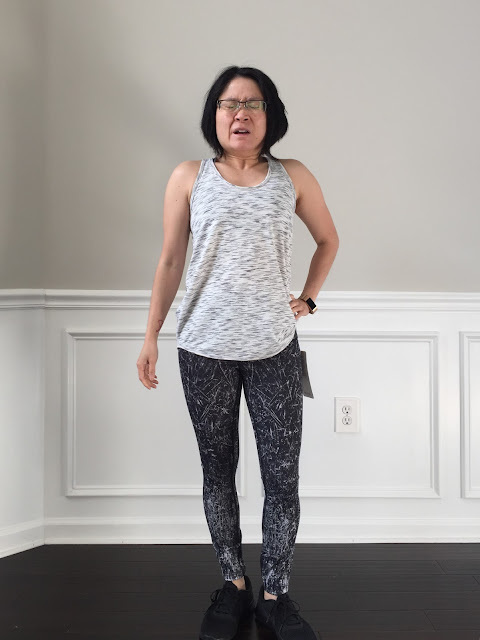 Here I am wearing my Essential Tank (I have heathered whirlpool on the way) and Wunder Under Hi-Rise Nulux Tight in alouette. I ordered the tights, forgetting that the length of these are 28 inches and not 25 inches. These are sadly going back even though my husband offered to pay for these if I wanted to keep them. He apparently thought I looked really good in them because they accentuated my leg muscles? I don't see it, but I'll take his word for it. Haha. 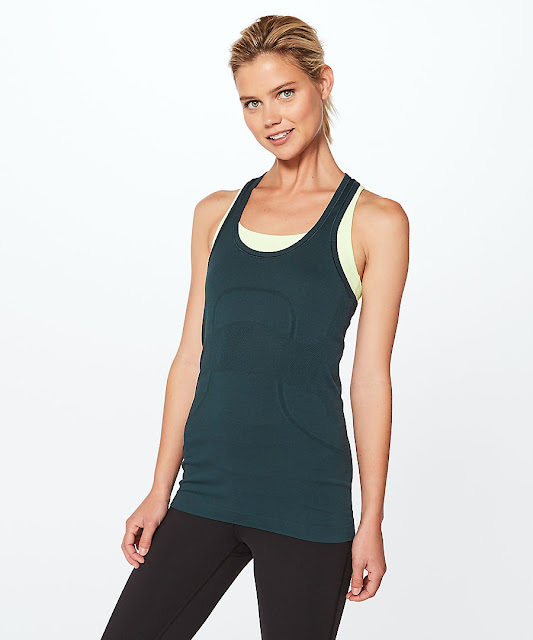 In other news, I was at work when Lululemon dropped their limited edition collaboration collection with Taryn Toomey. 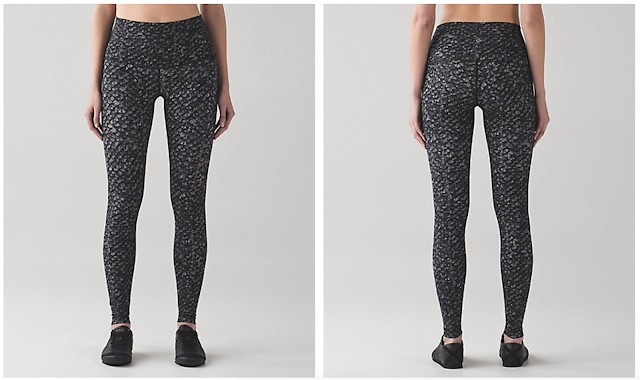 I was too slow and missed out on Awakening Tights and Awakening Crop (completely sold out now) in my size. I'm hoping over the next few weeks there will be some returns so I can at least try a few pieces. Did you order anything from this collection? Would love to know! Besides the new limited edition pieces going up today, Lulu also snuck in a few other pieces. This Swiftly is kind of tempting. I think I would have bought it if it were jaded? And lastly, there are also a few items on WMTM worth mentioning. That's all for me! Hope everyone has a great weekend!! I agree with you husband! Those tights look nice on you I think the pattern is very flattering. I was wondering if you could give me your opinion on the aligns vs wuc in luxtreme. I want to get the jaded color and usually stick with luxtreme. I am tempted to try the align crop this time around but am worried about pillng. Have you had any issues with you aligns pilling or being more fragile? I think it depends what you're going to use them for. If you're doing heavier workouts I would stick to luxtreme. You definitely can't run in Aligns. If you're planning on doing light activities in them and use them for casual wear I would say the Aligns would be fine. These do tend to pill because they are delicate. I've had a pair of align pants that are over 2 years old and they're starting to pill a bit. I can still wear them but they do not look new anymore. That's why I bought jaded. It's my back up pair to my alberta lakes. I was about to ask the same question and glad you answered it. The aligns look so beautiful but reviews about piling got me thinking as I do alot of HIIT and no yoga at all. I guess i will stick with luxtreme. I do wonder if the slicker fabric will hold up better. I'll keep an eye on it and will write another review after wearing them for a few months. 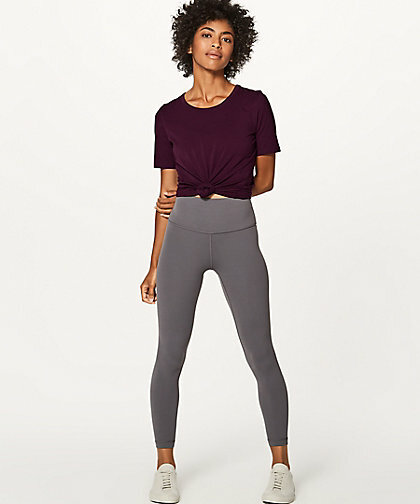 Love the black currant and jaded Align crops! Hehe love the sneezing pic! :P I agree, those tights/pattern do look very flattering! And not solid black so it's interesting! I'm eyeing the submarine swiftly tank and icemilk hotty hot shorts. The submarine/icemilk combo would probably work too! Get it to try! I also noticed the black currants don't feel quite as soft and suede-like as a previous pair of aligns! Glad I'm not the only one! Yeah me too, that was the one thing I really wish I had gotten out of the whole collection! 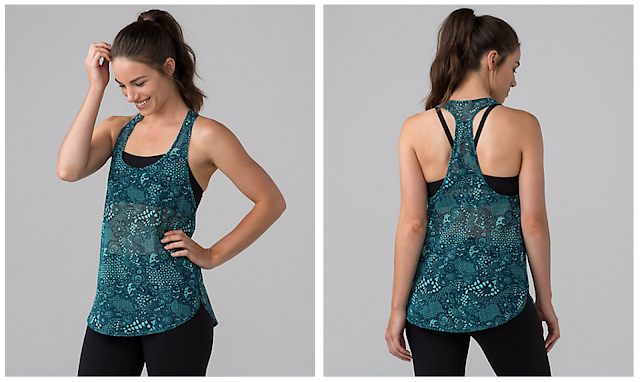 Just found this blog, love your detailed reviews and all your lulu's look great on you! Hi Carol! Thanks so much! Just out of curiosity, how did you come across my blog? See what's new at Athleta! Werkshop Review! Unicorn & Elf Crops! Werkshop Enchanted Forest Sneak Peak!